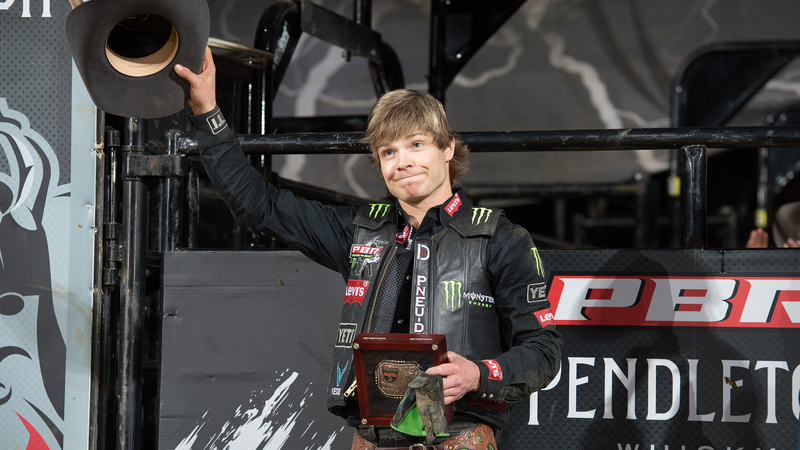 WHEELING, W.Va. – As the dirt settled on Saturday night in Wheeling, West Virginia, PBR’s (Professional Bull Riders) Derek Kolbaba (Walla Walla, Washington) won the Pendleton Whisky Velocity Tour’s Neighborhood Ford Store Challenge at WesBanco Arena. Following an 86-point ride aboard Black Ice (Rickey West Bucking Bulls) in Round 2, Kolbaba rocketed from the chutes aboard Roll of the Dice (Sustaire/Barrett Willis Bucking Stock LLC) in the final round of the night. The West Virginia crowd roared when his 86-point score came in, vaulting him from No. 35 in the world standings to No. 18. The win earned Kolbaba 220 world points and a $6,166.67 paycheck. Three-time world champion Silvano Alves (Pilar do Sol, Brazil), also on the hunt for additional world points over the weekend, finished in second place, collecting a paycheck for $3,500 along with 90 world points. He rode to the runner-up finish compliments of his 82 points aboard Frogger (Sho-Me Rodeo) in Round 2 on Saturday night and later his impressive ride on Blood Money (Melon Bull Co) for 84 points in the championship round. The second-place finish moved him from No. 17 in the world standings to No. 12. North Carolina cowboy Eli Miller (Statesville, North Carolina) finished third overall for the weekend compliments of his second-place finish in Round 1 on Friday night and an explosive ride in the championship round aboard Inferno (TCB Ranch/K-C Bucking Bulls) for 87 points. The young gun took home 80 world points and a paycheck for $3,500. Brazilian rider Ramon de Lima (Rio Branco, Acre, Brazil) took home a fourth-place finish, collecting a paycheck for $2,600 and 45 world points. His Round 2 ride aboard Red Man (Melton Bull Co.) for 85.5 points secured his place in the championship round, where he made the 8 aboard How Bout It (UTC/ Sellers Bucking Bulls) for 86.5 points. Rounding out the Top 5 was Michael Lane (Tazewell, Virginia) with an 85-point score in Saturday’s Round 2 aboard Simple Man (UTC/Sellers Bucking Bulls). Despite being dispatched off of Ram It (TCB Ranch/K-C Bucking Bulls) in 6.21 seconds in the championship round, Lane leaves West Virginia with 25 world points and $1,240. Blame It On The Whiskey, a bovine athlete owned by JQH Bucking Bulls and Skip & Elaine Jones, took home the top bull score of the weekend with a 43.5-point recorded out in Saturday’s championship round. Veteran rider Wallace Vieira de Oliveira (Goiana, GO, Brazil) stood no chance against the rank bull as it dispatched him after 2.11 seconds in one of the final rides of the weekend. The Velocity Tour next travels to Fresno, California, for the two-day Fresno Invitational on March 22-23 at the Save Mart Center. 1. Derek Kolbaba, 84-86-86-256.00-220 Points. 2. Silvano Alves, 80.5-82-84-246.50-90 Points. 3. Eli Miller, 86.5-0-87-173.50-80 Points. 4. Ramon de Lima, 0-85.5-86.5-172.00-45 Points. 5. Michael Lane, 83-85-0-168.00-25 Points. 6. Eduardo Aparecido, 82-0-63.5-145.50-10 Points. 7. Marco Antônio Eguchi, 87.5-0-0-87.50-55 Points. 9. Scottie Knapp, 84.5-0-0-84.50-10 Points.